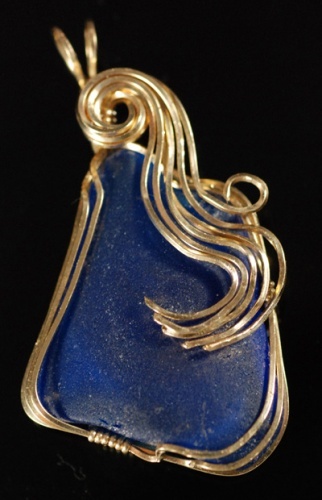 This beautiful deep blue sea glass piece is enhanced with swirls and curls of gold filled wire.The swirls resemble the waves on the ocean. Harvested from a local beach, this is truly one of a kind. Piece measures 2" from top to bottom and comes with an 18" gold filled chain.